A reach truck is a type of lift truck that may also be referred to as a stand-up reach truck, a straddle reach truck, or a double-reach truck. Reach trucks differ from conventional, counterbalanced forklifts because they are custom-designed to work in narrow aisles (NA) in racked pallet storage with lift heights of up to 40 feet (12 m). For example, standard rack storage systems are structured around a counterbalanced forklift’s maneuverability characteristics and have an average aisle width of 12 feet (3.7 m). In a narrow aisle racked storage system, aisle width can be pared down to eight feet (2.4 m); storage density increases by a third or more. Racking height is also an important feature of this type of warehousing system. The higher the pallets can be stacked, the greater the storage density. Reach trucks were invented nearly half a century ago and evolved as the warehousing industry investigated ways to increase storage density. 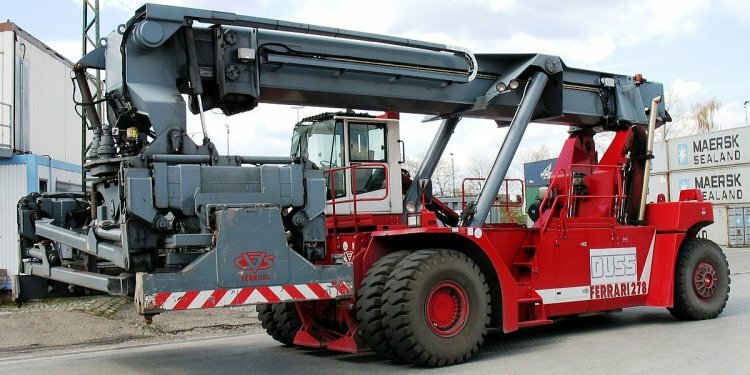 Its predecessor was the straddle truck. The first reach truck was introduced to the North American market in 1954. Designed by Raymond Corp., the reach truck featured a pantograph mechanism for which the company received a patent. The use of reach trucks would literally transform warehousing operations as more racked storage could be placed within the same amount of space. Basic reach trucks feature an outrigger mechanism positioned on the front of the truck. A pair of telescoping forks is designed to move up and down. The fork carriage also includes a hydraulic set-up that enables the operator to pick up and reposition loads over the outriggers. This helps to stabilize the load and provide the reach truck with greater maneuverability in aisles as narrow as 10 feet (3 m) across in between storage shelves. The hydraulic set-up also permits the forks on the truck to swing and lower the pallets for easy shelving by essentially unloading and then sliding pallets right into place. The most common style of reach truck built and used in the U.S. is a narrow aisle reach truck called a pantograph. The pantograph comes with a scissor-like mechanism. The inclusion of this mechanism is what provides the pantograph with a greater reach capacity. Pantograph reach trucks can be designed with a single pantograph to handle pallets in single-deep storage or with a double pantograph to handle pallets in double-deep storage. The single-deep or single reach model is the predominant type of pantograph reach truck used in North America today. The moving-mast (MM) reach truck is another option in reach truck design. Though not as common as pantograph reach trucks, the moving-mast features a mast that rolls forward for the placement and retrieval of pallets into or out of a racked storage system. Though it is not designed for double-deep stacking, proponents of this model argue it is has greater flexibility over a pantograph because its smaller-diameter wheels enable it to operate dockside as well as in narrow aisles. A stand-up reach truck is the simplest type of reach truck. It is designed to slide the forks directly underneath a pallet and transport it to another storage location and slide it back into place. A double-reach truck, also called a double-deep reach truck, operates in a similar manner to a stand-up reach truck but comes equipped with telescopic forks that extend long enough to retrieve and unload goods two pallets deep inside a single rack. A straddle reach truck is a reach truck designed to not only slide under pallets but also grab onto the sides of the pallet, essentially straddling it.